Are you a regular wig wearer and looking to make dreadlocks on your hair wigs in Canada? 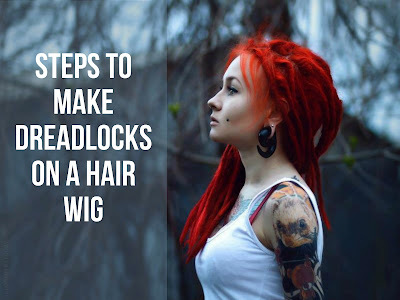 Here is how to create dreadlocks on a hair wig. First, you need to mark the dreads by braiding the hair. You need to hold the hair wig on the wig head utilizing sewing pins and start to braid the hair. With this braiding step, it becomes easy to avoid the hair to tangle while handling it. You need to hold the wig between your toes and begin with the bottom row. Then, you have to undo the braid and comb the hair. You can then roll your hair and then crimp them with hair again until you get a thick tangled strand. After that, it is suggested to roll this thick tangled strand between your hands to develop a thinner dread. Make it tight as much as you can! Then stick this strand by twisting the end of the dread. Once you shaped up your dreadlock, you need to dip a rag in the water bowl and squeeze it. After that, place the rag around the dread. Then, you can use a hair-straightener to iron the hair to remove the tangles and fix the dread. It is imperative to move the rag, iron the hair, move the rag again, iron the hair again and so on. When the rag becomes dry, be sure to dip it again into water bowl. It is suggested to repeat this step a few times until the dread gets fixed. You must repeat this step 3-4 times for each dreadlock. Once the dreadlock stays fixed, some holes may get visible at the wig foundation. It is suggested to add wefts to fill the holes. You can cut two pieces and need to make extra dreadlocks. You need to create two new dreads same as discussed in the step 2 and 3. Then, you have to hold the hair with clips to fill the holes. It is advisable to sew each dread on the wig foundation with a needle and thread. Finally, you can add decorations by choosing embroidery threads in numerous shades. You can out the cuffs on your hair dreads and utilize a needle to pass the thread through dreadlock and shape it. Tie a knot to hold it. Hope, this tutorial is helpful for all guys who are looking to make dreadlocks on their synthetic or human hair wigs. Good luck!